Conservation groups are raising red flags about what they say are two significant fish kills in Ellsworth and Brunswick over the past week. They say both illustrate how the dam owner’s plan for fish passage isn’t working. The groups are also frustrated with what they say is a lack of response from federal and state fishery regulators. 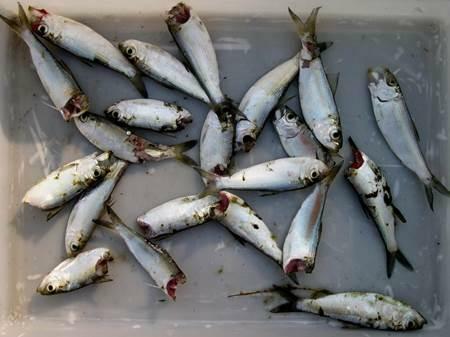 Dwayne Shaw of the Downeast Salmon Federation says staff and volunteers first noticed dead alewives showing up on the Union River below the Leonard Lake Hydro Dam in Ellsworth about a week ago. Many appeared to have gotten struck by the blades of the dam’s turbines. So Shaw says they then reported the problem to federal and state agencies including the U.S. Fish and Wildlife Service, NOAA Fisheries and the Maine Department of Marine Resources. That fish kill near the Brunswick-Topsham dam is estimated to have killed thousands of out-migrating fish, says Ed Friedman of the group Friends of Merrymeeting Bay. Friedman says he personally went to the site over the weekend and documented and photographed several hundred dead fish himself. His group has long been working to ensure safe fish passage for migrating fish like endangered Atlantic salmon, shad, alewives and eels. But Friedman says fish passage at the site remains inadequate. 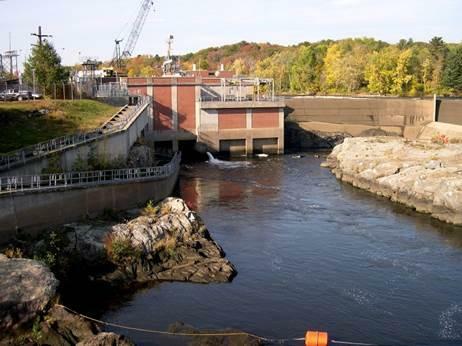 Brookfield Energy's Androscoggin River dam between Brunswick and Topsham. “The only way for fish to get by there without going through the turbines when there is no spill over the top of the dam is through an 18-inch little down spout pipe located right next to the turbines,” Friedman says. Both dams are operated by Brookfield Energy which has been the subject of at least one similar complaint in the past. A spokesman for the company declined to talk on tape, but in a written statement Brookfield said it is quote — “constantly working to minimize the potential environmental impacts associated with our operations and activities.” Brookfield said it is in communication with Maine regulators to modify operations when needed as a way to avoid fish mortality. Dwayne Shaw disagrees with that assessment. He says Brookfield, which is in the process of relicensing the Ellsworth dam for 30 years, has not taken corrective action to protect alewives and other fish. Calls to the DMR and the U.S. Fish and Wildlife Service seeking comment for this story were not returned by airtime.